The ritual of the morning hike comes with its predictability. The wide wood chip covered path that leads out from the parking area is surrounded by open fields that are dotted with wildflowers. 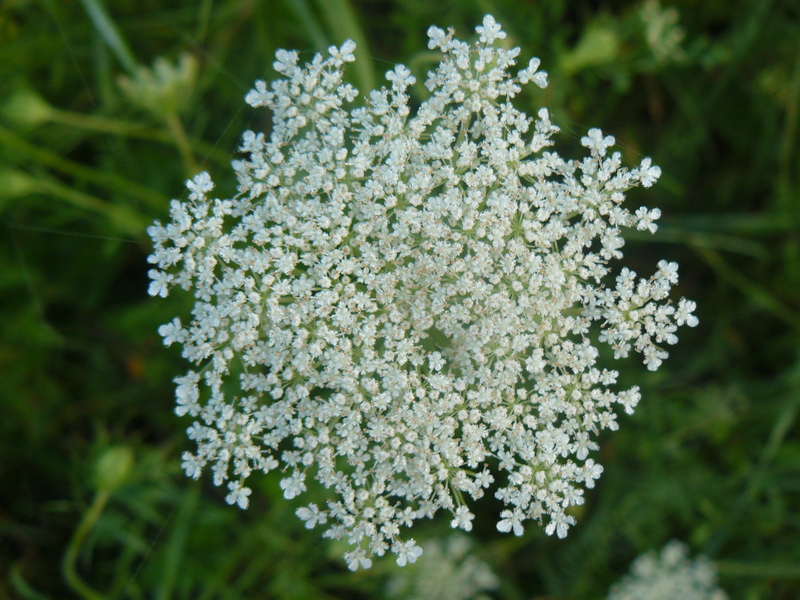 This morning my attention goes to the queen anne’s lace, a childhood favorite. I zero in on the perfection of a single blossom. Isolated this way it reminds me of a single snowflake. We continue into the trail and I see the flash ahead that tells me he is here. Every morning we encounter the same man in the same place. He is walking meditatively, significantly without a dog. Nora senses his presence, pricks up her ears, and body wiggling back and forth, approaches him like she always does with enthusiasm and a desire to connect. But I have anticipated his response and feel my whole insides clench in recognition of his resistance to engage. Sure enough, he stops walking and freezes. Nora jumps. He responds with exasperation. I suggest to him to just keep walking and she will ignore him. The moment is over and we continue on in our opposite directions. It happens just this way every morning. The knot in my stomach unwinds as I think about how this could be a different outcome. He could stop resisting of course. I could choose to come just a little later in the morning, follow a slightly different path, and miss him altogether. Or, I could yield to the situation and trust that what is happening is okay. I could anticipate the encounter with openness instead of dread of concern that I am not in control of my dog’s behavior or being a bad mother. It reminds me of when I would take Ben to the grocery store as a young boy. Ten people would go by without any mishap and then bam, he would throw himself at the eleventh person spontaneously, looking to hug and be hugged. This charm of his open hearted Down Syndrome way was met in kind nine times out of ten. But it was that tenth person’s reaction that always conditioned how I would anticipate our next foray into the public realm. The temperature has dropped again and everything is sparkling clear this morning. I have been living all these years with the belief that trust can only live in love. Climbing up the steep incline of the first section of what is becoming the ritual hike, I consider how yielding happens in the space between love and fear. Yielding is a choice, that delicate line of deciding to push through or let go. As I am learning after years of yoga practice, either choice is okay when made in awareness of the moment. Each choice requires trust in the support that will let me just flow to where the choice is taking me. It is a revelation to consider that trust might actually live in this space between love and fear. We are approaching the turn off to the ridge loop I have chosen not to take the past two mornings in favor getting back to the water’s edge sooner. But I had already decided some way back that I would continue on the loop this morning. How does Nora know? Yesterday she continued down the trail to the brook, but today she took the turn off to the ridge loop. I follow her up into the trail. What if she is actually sensing and responding to my angst as we approach the solitary man on the trail each morning? And like the spirals that move through my heart and entice me to yield into a challenging pose on the mat, I feel the knot completely unwind and dissolve. What comes up now is a flash of emotion and tears of recognition. I am solidly in the heart of where this particular thread has been leading me, realizing how much I yearn to be able to say ‘I love you’ without the need for control. I realize how freeing it would be to yield to the truth in the moment it is being said, to be able to trust just that. We’re headed to the exit of the trail and Nora begins to encounter her buddies. Being the dog world that it is this time of the morning, I know all their names, even if I don’t know their humans’ names. First we encounter Elosie, Griffin, and Oscar. They run around each other for a minute or so, but do not settle in for any serious play. Nora instead jumps up to greet their human and he smiles, happy to reciprocate the love. Then we meet Maggie and Ruby. Ruby and Nora have a special bond. Their dance of romping and playing is balanced, harmonious and fun to watch. Satiated, Nora feels no need to jump up for love with their human as we part ways. Next is Lea, Sirius and a new acquaintance this morning, Zeke. More greeting and romping and exploring. We finally reach the wood chip covered path. I look out into the fields and a particular bouquet captures my attention. 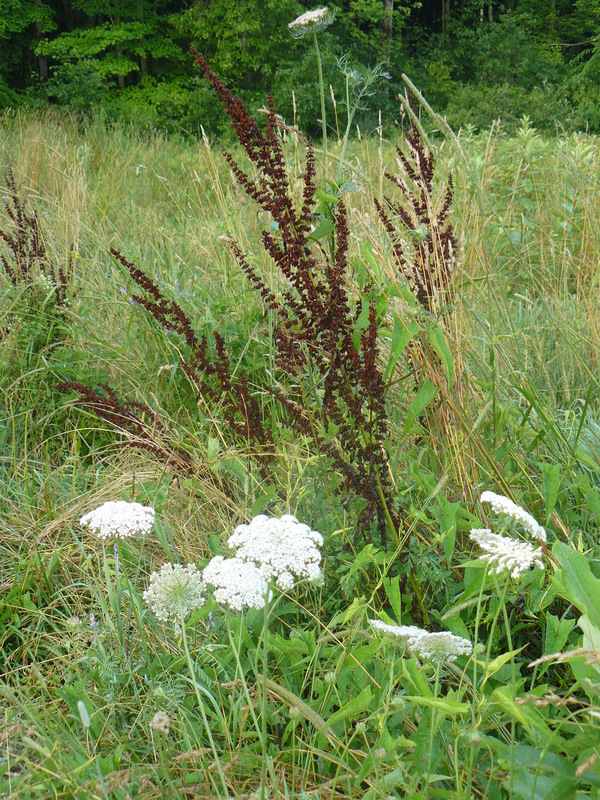 The queen anne’s lace is one of many now, happy to be occupying space with all the other wild things just like this.